Cantonment Board Women Skill Development Institute Hyderabad Cantt Sindh. Matric+Diploma (DDM or DVG) + 5 years of teaching experience. Matric+Diploma (DDM or DVG) +3 years of teaching experience. 1-year Diploma from recognized Parlor with 2-Years teaching experience. Matric+Diploma 1 Year + 1 Year Experience in any relevant field or Culinary Diploma 2 Years + 1 Year Industrial Experience or F.A + 2 Years industrial experience or DAE Food Processing and Preservation. BSC Home Economic + field experience of 2 years or above. Computer Science/BS Computer Science + 2 years of teaching experience. 1. The postal envelopes on the position for which job is applied duly written address of the candidate should be attached with application. 2. The application should be addressed in the name of the Cantonment Executive Officer, Hyderabad Cantt. and shall be in CB Public High School & Girls College, Defence Officers Housing Society - II, Hyderabad Cantt. 3. The above-mentioned posts will be non-transferable. The recruitment shall purely be on contract basis and shall remain as such. 4. The salary package will be as per policy of the HQ ML&C Department as amended from time to time. 5. No TA/DA shall be admissible for interview/test. 6. Only shortlisted candidates will be called for interview/test. 7. 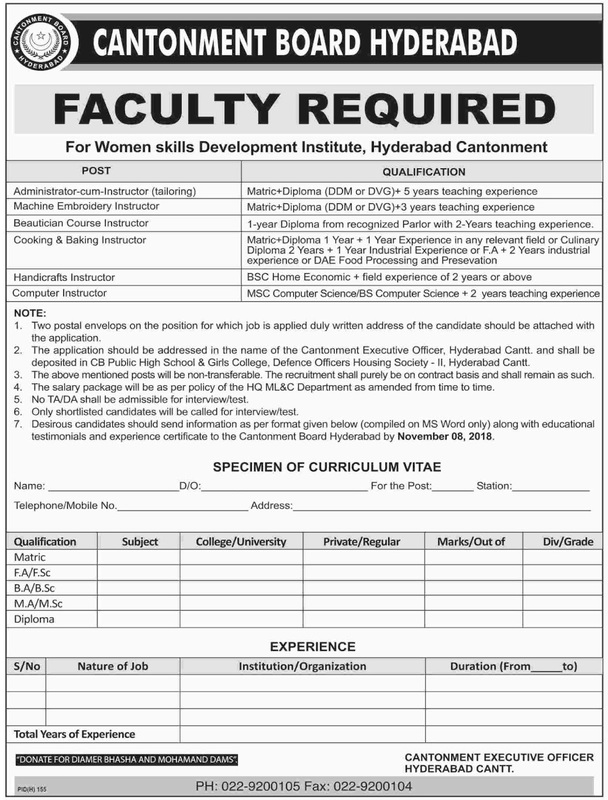 Desirous candidates should send information as per format is given below (compiled on MS Word only) along with educational and experience certificate to the Cantonment Board Hyderabad by November 08, 2018.